Here at Echollective Farm and CSA though we focus on the widest variety of vegetables available for the New Pioneer Co-op, Farmer's Market stand and direct to our CSA members, we have one single crop in which we put a lot of time, and take a lot of pride-- Garlic! 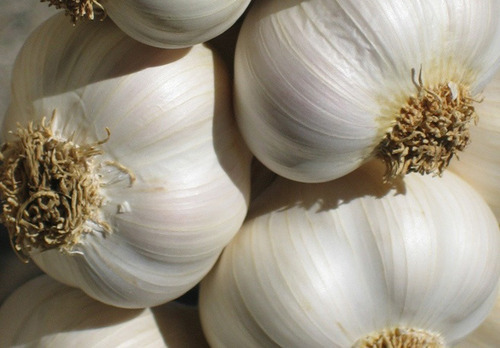 Not just one single variety of garlic, but many hard-neck varieties. All our varieties are organically grown, and sustainably hand-harvested each Summer by our team of farmers, interns and volunteers. We are not USDA Certified Organic, but we try our utmost to adhere to those standards nevertheless, and even go above and beyond them. We cull our largest bulbs of garlic for seed sale, leaving the smaller bulbs for edible sale, which are still rather sizeable. These varieties are available for food (table) sale at the New Pioneer Co-ops! Music Variety. Echollective's standard variety of garlic. We have it in spades, being the variety we grow the most of, and also due to it being such a successful producer! Trials show it can produce over 13,500 lbs. per acre. 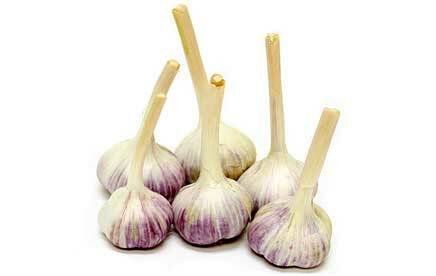 Music is your typical garlic, with a medium-hot profile that persists through long periods of storage. Skin is pearly-white, sometimes showing blushes of pink or even purple striping. Very cold tolerant. Big cloves. Will store from 9 months to a year. For the majority of our varieties, but especially Music, we have been breeding the same strain of garlic year after year, never buying new seed but building off of our own genetics and replanting from the previous year's crop. This has produced our own unique variety of Echollective Music over the years. Perhaps it has localized traits specific to growing in Iowa, but it will retain Music's widely-adaptive genetics. German Red Variety. We've been working on this variety a few years, too. Though termed German "Red", this variety shows mottled clouds of purple against a white-to-tan colored skin. Smaller than Music but with a spicier, more intense flavor and a well-rounded tolerance to cold, its name is said to originate from the German immigrants that brought this hard-neck variety to North America from Europe. Elephant Variety. 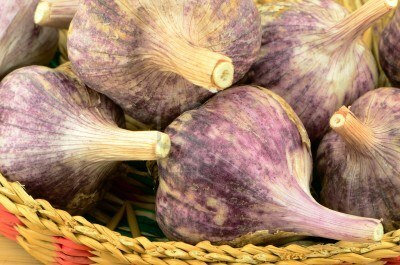 Gigantic bulbs with a mild flavor, lacking the intensity of typical garlic. Technically not a garlic....but a large-bulbed leek! Beautiful, enormous bulbs procure incredibly large cloves (just look at the picture!) which seem to work really good as roasters. Put them in the oven for a bit, remove skins and you've got a spreadable garlic you can put on Texas toast or a tamer version of garlic bread. Works great mixed with other roasted veggies, whole or tossed in stews, and allowed to slow-cook. 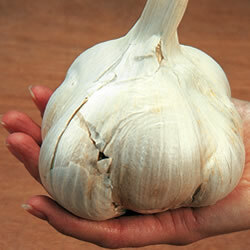 Elephant garlic has a wide range of tolerance to the cold as well. 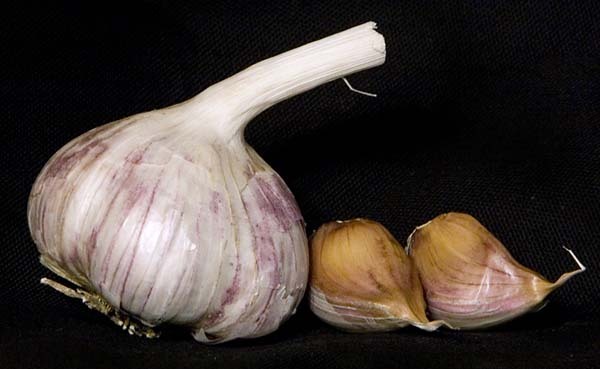 Since bulbs get so big, this garlic should be planted a wider spacing apart from one another. Purple Glazer/Stripe Variety. This variety can get incredibly showy! It is certainly bred for its beauty and makes for a spectacle amongst other kinds of garlic. The name says it all-- well-defined stripes of purple against a satin-white background, accented with interludes of silver and sometimes gold. 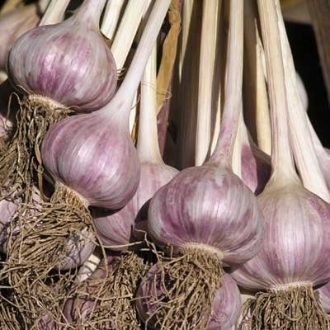 Purple Glazer is also renowned as a roasting or baking garlic because of its milder profile. Though its got a stronger garlic-y taste than Elephant, it does not have the hot after-taste. Said to originate from the Republic of Georgia and is therefore fairly cold-tolerant. Ukranian Red Variety. Comes in an array of sizes, but has tendency to get larger on average. Wide range of tolerance to climate, and notable for its ability to store well. Ukranian has a medium flavor profile, a clear and pronounced taste with a warmth that lingers for a few moments afterwards. Less intense, it fares well in pesto or anything where you want that raw garlic influence-- but not too raw. Red and purple stripes are on these cloves, against a brownish-white background. Bogatyr Variety. The skin of this garlic exhibits a marbled white, brown and purple effect. Sometimes there is no purple, just a whitish-tan skin. Known to be one of the most intensely hot varieties of garlic around! Full-bodied flavor and a challenging, fiery pungency. For those intense, raw garlic lovers. Originally from Moscow, Russia, it prefers cooler climates and thus fares well in colder areas. Korean Red Variety. Bred in Asia, this breed proves to be quite versatile. Bulbs boast a strong and formidable flavor, followed by a gentler warmth. This variety was created for its importance in Kim-Chee recipes as it adds that ideal zesty garlic taste, but also lends its qualities well to a myriad of other dishes. Exhibits subtle but clear stripes of purple. Reasonably good storage variety and cold tolerant.